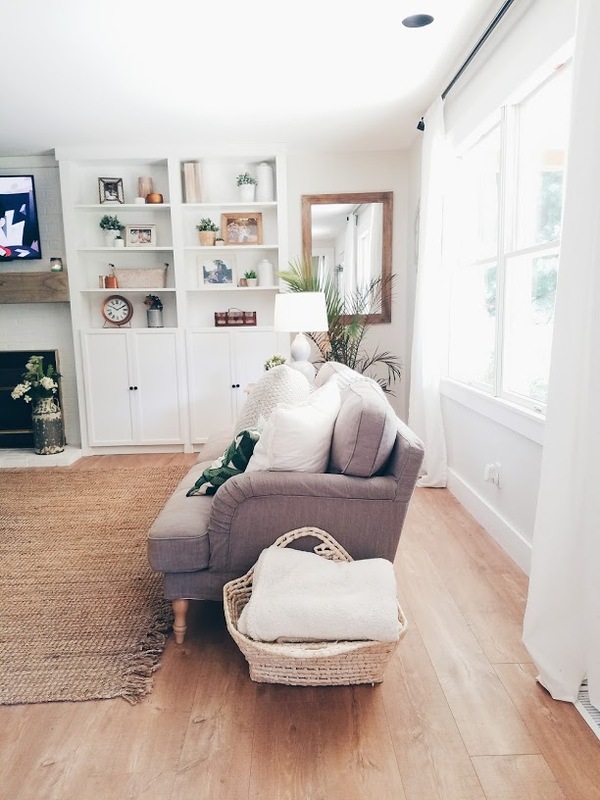 Since our last living room post there have been quite a few changes around here so it felt like time for a refreshed post on where the room is currently at and how we got there. I had a bit of a design identity crisis the first few months of this year and fell very deep into a creative rut. Suddenly everything in our home didn’t feel quite right. I’m pretty sure those words terrified Bobby, but thankfully nothing giant that was the issue - it was mainly finishing touches. WARNING: Personal stuff below, if you’re just here for design - skip a few paragraphs. Social media can get very discouraging and it can be difficult to figure out your voice in it all with constant exposure to TONS of beautiful homes and aesthetics. We went into this home thinking “ it’s a cute country colonial - naturally we’re doing FARMHOUSE!” Right? Farmhouse has been the thing for a while now. So I followed 1000 different farmhouse accounts and thought “this is how you decorate a farmhouse".” It didn’t look bad by any means, but I wasn’t letting my instinct lead my choices. So I took some time away from Instagram and posting, dove into Pinterest, design books, books just for pleasure, started Pilates again and actually picked up a paint brush (an ACTUAL art paint brush not one for walls). I've started tackling some software and trying to learn more about E design. I've been listening to podcasts about design and grabbed my notes out of storage from my high school art class about color theory. Realizing that my brain was craving to learn, engage and grow but in turn found it very calming and helpful to figure out the next move. And it seemed to work?! My design voice seemed much clearer and completely different than this time last year. 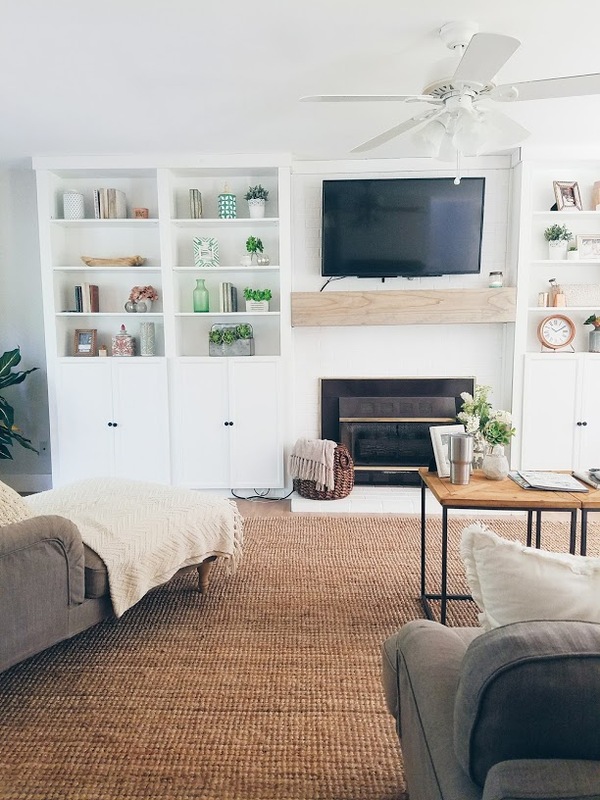 I'm gravitating towards darker woods, moody paint colors, focusing on adding contrast; implementing some modern furniture, textures, sleeker lines, more eclectic, boho, mid-century modern, Scandinavian sort of farmhouse. I've also almost completely switched from the cool color wheel to warm. I'm infatuated with oranges, corals, pinks, mauves, brass and coppers right now and it's making a massive impact on our spaces. All of the cream texture on the couch with the backdrop of the wood ladder to break up the wall of grey/white adds so much more interest. Also, the curtains guys. I swear I have a deep emotional connection to these curtains. Life changed when they came into our home. The quality is amazing, the floral motif print is so unique and I’m in love with the color palette. If you love them as much as I do please don’t hate me (they are sold out) but seriously, I. love. them. Adding a mix of brass finishes in combination with the warmer color palate is one of my favorite changes. Brass is BACK y’all. I mean not the ugly shiny stuff from the early 90’s but new and improved brass, definitely. 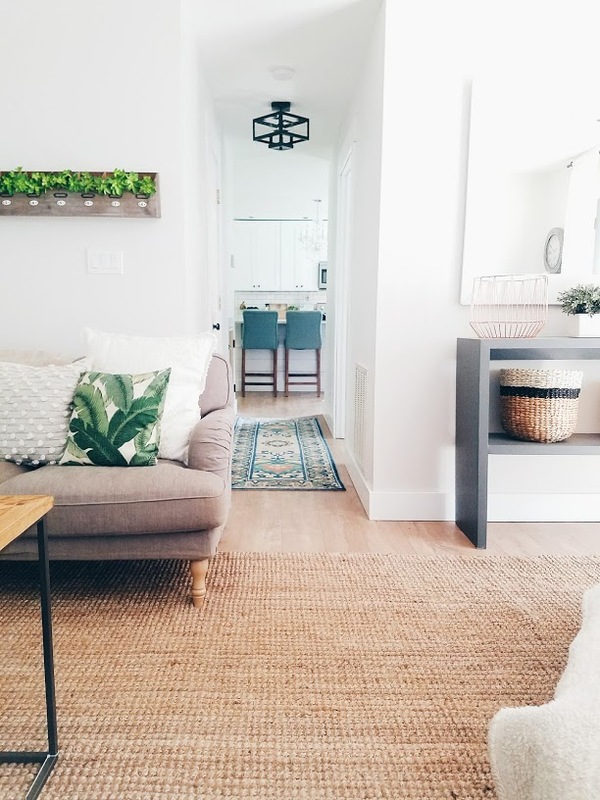 As weird as it sounds, I almost think the warmer tones compliment our home more. I don’t know how that’s possible because a home is what you make it, but it looks like this is how it was meant to be (at least to my eye anyway). I actually added the circle gold mirror before deciding to rework this wall and it instantly felt like too many near one another. 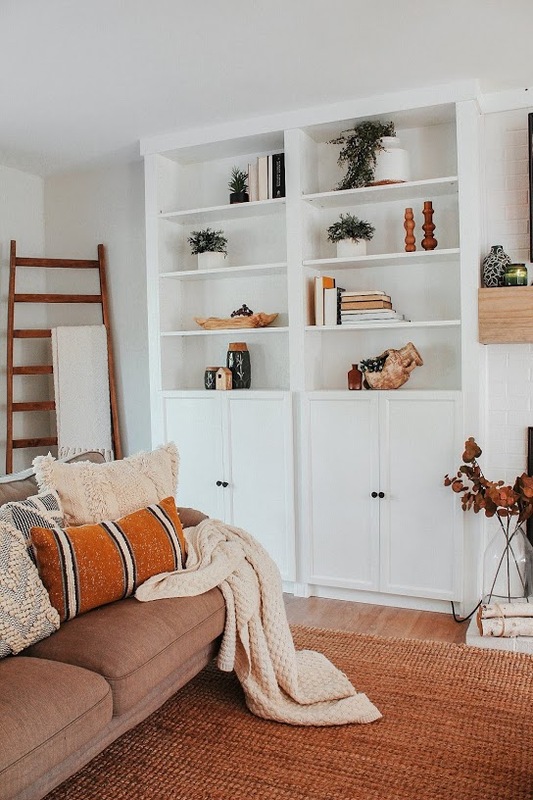 I loved our ladder so much I wanted to find more of that wood tone to carry throughout the room - plus I think it compliments the curtains really well. This table from world market was the perfect simple touch. The lamps are from Anthropologie, I got them during a great sale and the gallery wall wasn’t a plan until I stumbled upon the prints on a Target trip one day (probably there to buy deodorant). I’m glad I did though because it adds so much more visual interest and height to the space. I have always wanted a leather couch, but it wasn’t in the budget. This beauty however was. Is it weird to say I feel like a grown up now? It’s just a show stopper. Her and the curtains are in a constant battle for my affection as favorite part of this room but, it’s too close of a fight and we’re going to call tie. Simplified shelves, bamboo shades, the curtains, the cognac lamp. It just feels so much better. 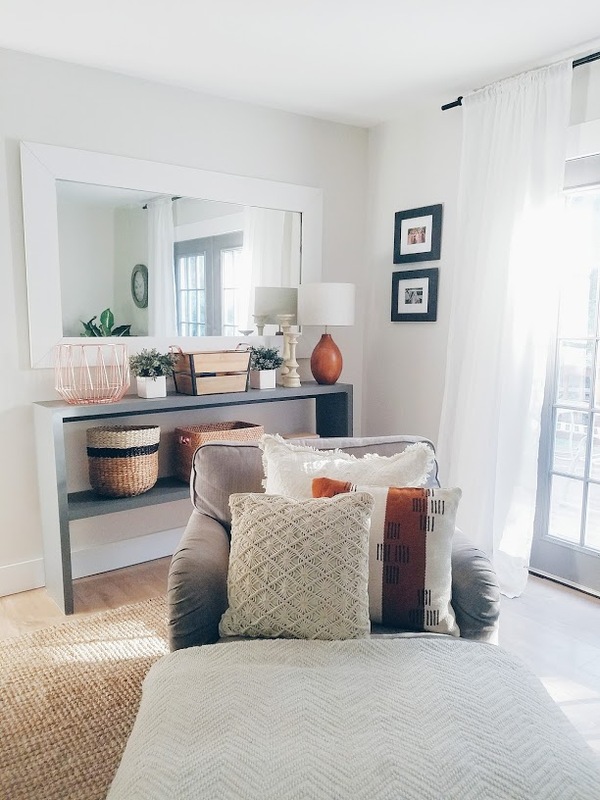 If you’re reading this and your home in any way feels more like the before pictures and not the afters but YOU LOVE IT do not feel compelled to change a single thing or think that I am criticizing your design choices. To reiterate: my home did not look bad before, however it wasn’t us. This was more about self discovery, listening to the unique part of your creativity that makes your style YOU, finding your own flow, balance and place in your design aesthetic. I’ve always been a bohemian, free people loving, wish I was living in the 70’s sort of girl. I think it was predetermined when my mother named me after a Fleetwood Mac song. So this vibe makes much more sense in my heart than the previous. It feels effortless and organic rather than forced. For me, interior design and decorating is a form of self care. My home is my happiest place and where my introverted heart unwinds and I desperately need it to make me feel good when I walk into it everyday. On the opposite end, if you are feeling in a creative rut, you can’t pour from an empty cup. Try feeding yourself with things that you love and make you feel inspired and take care of yourself, whatever that means for you. I swear it makes a massive difference. If you stuck around this long, thank you for reading and stay tuned for the next project!